According to Optoma, this model is a home theater projector meaning that its main purpose is for theater-dark lighting. Still, it is actually a home entertainment projector that boasts an image that is bright enough to stand up to ambient light in a living room or family room. Whatever you wish to call it, Optoma HD26 Full 3D Projector can serve in either role, boasting a reasonably bright, high-quality image and support for 3D. It even has a remarkably short lag time (which is awesome considering this is a projector). So, if you are a game lover, this feature makes this projector a great choice for your gaming purposes. This model has two HDMI ports, and one of those is MHL (Mobile High-Definition Link) enabled. Thanks to those two ports, it is easy for the users to install this projector with, for example, Blu-Ray player and a cable box both connected, so they can switch between them with ease. At 3,200 lumens, this projector offers really high brightness rating. Setup on this projector is standard, with a manual 1.1x zoom and manual focus. All the connectors are located on the side, with options for image input confined to the 2 HDMI ports. Only one of those ports offers MHL, however both of them offer full support for 3D from different video sources such as a cable or a Blu-Ray player or FiOS box. 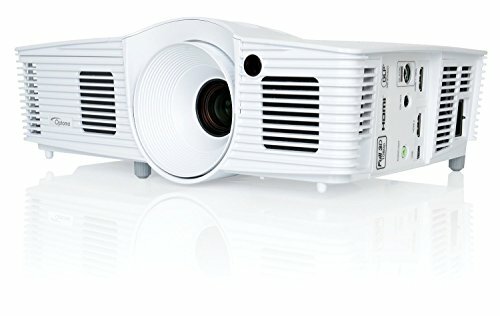 The size and weight of this projector (4.0 x 12.4 x 8.8 inches, and 5 pounds 8 ounces) are in line with the Optoma HD26 Full 3D Projector’s role of home entertainment projector. If you do not have a place where you can set it up permanently, its light weight and small size make it extremely easy to store away when you are not using it, as well as to set it up easily and quickly as needed. The Optoma HD26’s audio system is really awesome, with built-in audio that helps make this projector a great fit as a home entertainment projector. The 10W mono speaker provides great sound quality, with more than enough volume to fill a living room or a family room. Of course, if you’re looking for even better sound quality, you can always plug an external sound system into minijack stereo output on this projector. Image quality as well as color quality is impressive, and blacks are suitably dark on the Optoma HD26. The projector does an outstanding job with shadow detail and skin tones, and there are no motion artifacts. The only downside is, as with nearly all DLP projectors, this one also shows occasional rainbow artifacts (flashes of green, blue, and red). Finally, one big plus for this model is its short lag time making this projector a great choice for gaming.